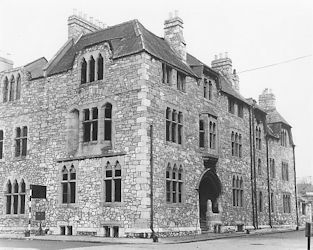 The Anglican Church of Saint Stephen, the First Martyr, was situated on the corner of Clowance Street and George Street, Devonport. It no longer exists. The remains of the Anglican Church of Saint Stephen, Devonport. © Plymouth City Museum and Art Gallery. The ecclesiastical parish was formed on August 27th 1846 from the parish of Stoke Damerel. The foundation stone was laid on the Octave of Ascension Day, 1852, by Mr E Saint Aubyn. It was built at a cost of £7,000 to the designs of Mr J Piers Saint Aubyn. The building was in stone and in the Middle Pointed style and at the time of its construction could accommodate a congregation of 764, all free and unappropriated. It consisted of chancel, nave, aisles, and a central tower with lofty spire, 160 feet tall, containing one bell. Saint Stephen's was consecrated on September 21st 1858 although it required a second aisle to be erected before it could be said to be completed. Saint Stephen's Vicarage was an architectural gem in itself. 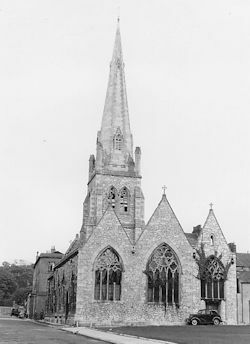 Only the walls and spire were left standing after the Second World War, as can be seen in the first photograph above, and during the 1950s services were held in the Anglican Church of Saint Aubyn, into which parish Saint Stephen's was later amalgamated. The Anglican Church of Saint Stephen was demolished in 1958.